NEXT Financial Group joined forces with Toys for Tots for the fourth consecutive year to donate toys, books and games to children in need this holiday season. “It’s an honor, as well as a civic duty, to ensure that all children have a special holiday season,” said Barry Knight, President of NEXT. NEXT Financial Group Inc. (NEXT) joined in the gift-giving season by working with Toys for Tots to help make the holidays special for underprivileged families in need. Throughout the months of November and December, NEXT’s home office employees donated brand new toys that were collected by the U.S. Marines and gifted to children within the local Houston community. 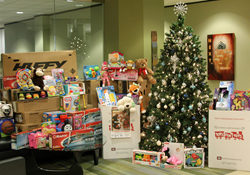 The Houston based independent broker-dealer has contributed to Toys for Tots for the last four years. The culture of NEXT is very people oriented in that it provides opportunities for its advisors and employees to participate with charitable organizations, such as Toys for Tots, to broaden the impact of both NEXT and its affiliates in the local community. This spirit of collaboration was exemplified when a local NEXT advisor joined in NEXT’s toy drive by generously donating 10 Huffy bikes and six Razor scooters. NEXT appreciates their Representatives’ involvement with the broker-dealer as well as their charitable programs. In an effort to further assist the public, long after the holidays have past, NEXT also contributed monetary support to The Marine Toys for Tots Foundation, an organization that has supported the goal of helping less fortunate children throughout the country since 1991. For more information about The Marine Toys for Tots Foundation, please visit http://www.toysfortots.org. NEXT is a Division III broker-dealer servicing approximately 750 independent financial representatives throughout the country. The firm was voted Broker-Dealer of the Year* by its representatives an unprecedented eight times and continues building upon their unique culture to better serve the needs of independent financial professionals and their customers. Securities and investment advisory services offered through NEXT Financial Group Inc. Member FINRA/SIPC. NEXT Financial Group Inc. is located at 2500 Wilcrest Dr. Ste. 620, Houston, TX 77042. P: 877-876-6398.